sunlight/heat. Improper storage could cause permanent damage to your fur and reduce its lifespan. 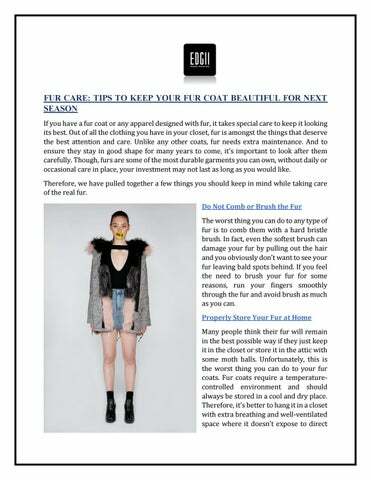 Address Any Damage or Blemishes Instantly Your fur coat is probably your major investment. With the cost of some fur coats in the range of $13,000-$15,000 or more, neglecting to take care of the same can mean money wasted. That’s why the need to keep your fur clean, beautiful and away from any damage or blemishes is unavoidable. Therefore, if you see a rip, tear, patch or any other blemishes or damage on your fur coat, take it to a professional fur coat cleaning expert right away. One small cut in your fur may get larger over time if overlooked, which eventually leads to more expensive repairs in the future. That’s why examining your fur before and after wearing is important, so you can take one step in case of any problem. Bonus tip: If you fur has a wine or perfume spill, have it cleaned immediately. Only Visit a Professional Furrier Do not risk taking your fur coats or jackets to an everyday dry cleaner or try to wash it at home. Due to the non-availability of necessary fur cleaning tools, a normal dry cleaner can damage your coat permanently. Moreover, regular home cleaning supplies available at your home cannot clean your coat properly and can leave unwanted residue behind. That’s why getting in touch with the specialist furrier is a necessity. Doing so, gives your coat a fresh clean look and maintains its durability for over years. Having your fur maintained now means it will be good to go when the fall hits, plus you’ll save yourself from beating the last-minute rush. Wearing the fur from the best Edgii Collections in Sydney not only makes you look stylish but also helps you pack your wardrobe with trendy yet luxury apparels without getting broke. 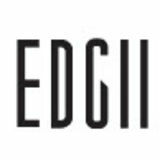 Edgii Collection in Australia is quite popular amongst fashion enthusiasts who are into fur apparels.